I was down most of yesterday because I didn’t wake up to write. I set my alarm for six – no, I had Dave set his alarm. At six I said, “six-thirty.” He reset it and we fell back to sleep. At six-thirty I turned on my light, reached for my notebook, and wrote half a page of drivel, about how I don’t want to write and I’m so sleepy and I have nothing to say. I was waiting for the magic moment, the spark into a surprise revelation or train of thought that makes the process worthwhile, but all that happened was I fell back asleep. When I woke again at eight-thirty I was clutching my notebook like a teddy bear. Why is it so important to me? What am I trying to prove? I have another half-finished story that’s lost steam and I think I can fool my subconscious brain into telling me the rest of it before the editor wakes up. At nine o’clock I opened the notebook again, this time at the dining room table, and wrote some more drivel. “I dreamed I was packing up the car but had to walk Django first but somehow she had to climb out of a basket of salad greens. She did it!” Then I wrote a scene for the story which I won’t use. There’s no need to use everything you write. That would be like a concert pianist performing a rehearsal for the audience. I know that. But it’s scary when the spark doesn’t come. I popped into Facebook and watched a Thich Naht Hanh video recommended by Susy. It was about how the left hand doesn’t punish the right when it makes a mistake, like accidentally pounding the left thumb with a hammer. The left and right understand that they are each other. Susy said she watched the video three times and was calmed. Leave it to the gods, Elizabeth Gilbert said in her TED talk, which I also watched. Maybe it was on the same YouTube page? Leave it to the gods but show up at the page, because Sinclair Lewis wrote 5,000 words A DAY. I read that yesterday in Wikipedia. At nine-thirty I got on with real work and spent the rest of the day writing video scripts. When Dave came back from his run I said for the millionth time, “I wish I could do that.” Then somehow it was eight p.m. and we were still working, which isn’t surprising when you don’t start til halfway through the morning. 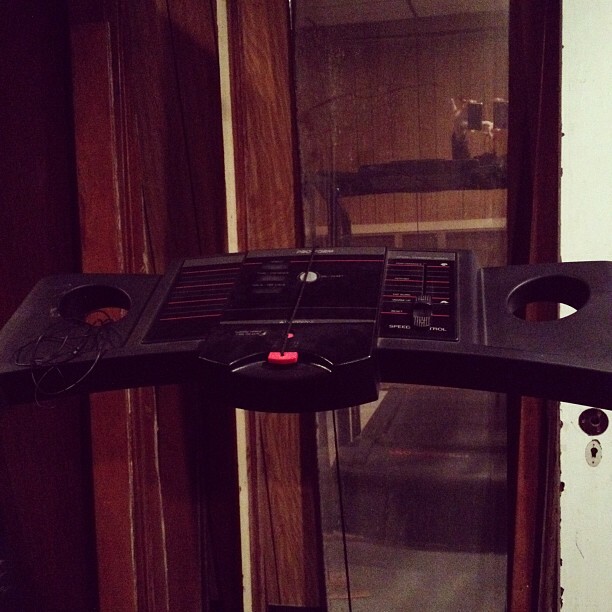 Instead of having dinner, I suited up for the treadmill. I’d been thinking about doing that since Dave brought it home a year ago. But I’m not a runner, and I’ve never used a treadmill. I’ve been busy saying, “If only it was a cross-trainer.” “If only I had an idea of the plot.” “If only I weren’t so sleepy at six a.m.” “My shoes are caked with mud.” “I have nothing to wear.” I put on some yoga clothes and knocked my shoes around over the garbage and Dave showed me how to start with your feet on the sides. He went back to work and I put my earplugs in and turned on Pandora to Eagles radio. As a runner I’m pretty wobbly. I walked and ran and watched myself wobble in the mirror Dave propped against the wall to check his form (perfect, the lady at Fleet Feet said). After 32 minutes I realized I need shorts, a sports bra, and some shoes that don’t pinch my toes. I also realized that I was happy. It felt good to sweat and try not to wobble while singing along with American Pie and Beast of Burden and Penny Lane and other songs that share musical qualities with the artist The Eagles. I didn’t write but I did something else I’ve been wanting to do. All I have is what I feel, and right now I feel the joy of wobbling. It’s pretty much what I expected to feel at six a.m. this morning, but instead it’s ten at night, I’m fresh from the shower, and my biggest struggle is between a toasted D’Amatos mini-focacchia and the last of the sweet potatoes. Beast of Burden rocks! I like all I have is what I feel. I’m into that lately. As much as I respect “Dodsworth,” I feel like the 5,000-words-a-day thing was some scam Lewis slipped onto his resume. Five THOUSAND words, Sinclair? REALLY?